Despite distractions like The Internet of Things and The Cloud, the RFID industry has quietly crossed the chasm. This article cites some of the signs of maturity and reasons for optimism for 2015. As with most new technologies, RFID went through an awkward stage while true believers looked for anyone who would use their new invention. During this phase, companies try to score users by flooding the market in waves of unasked-for new technology, products and buzzwords. With the Internet of Things, the Cloud and Big Data creeping onto RFID corporate websites, you might think we’re not yet done with that; but there’s reason for optimism. Here are some of the key trends surging now that say that RFID has outgrown its awkward adolescence and that 2015 will be a growth year. RFID retail inventory management can deliver benefits for most apparel retailers now.1 The basic handheld solution is not hard to understand, delivers real ROI and has a relatively low investment hurdle. Yes, employee training and compliance is a headache, but this is true for many jobs in retail, and it does not change the fact that significant sales uplift is not only possible, but typical. According to our analysis the ROI for RFID in apparel retailing is so strong that it is surprisingly insensitive to the price of tags.2 Retailers with a high proportion of replenished items like basics can expect sales uplift just from having well-stocked shelves. For those with fashion and seasonal items, avoidance of markdowns from better inventory visibility will boost gross margin dollars. Both can expect reduced shrink from better ability to discern loss patterns. Beyond this low-hanging fruit, the inventory visibility RFID provides is an asset for retailers implementing omni-channel strategies. Retail adoption of RFID for apparel has lifted off and will only accelerate as the number of brand owners and retailers using it grows. We even see some of these retailers deciding to tag all general merchandise. According to Geoffrey Moore, early adopters are willing to experiment with immature technology when it’s still full of bugs. That was certainly true during the Walmart case and pallet mandate, when a 30% yield loss on a roll of tags was acceptable. Back then users encoded case tags with rigs so primitive that they evoked stone knives and bearskins. Eventually these were replaced with printers chugging along at 2 inches per second. We slapped and we shipped. An early analysis said that the total cost of ownership of a case tag was $5. Slap and ship labels circa 2005 had double-digit quality fallout. Much has changed. In 2013 Kirk-Rudy launched a machine that encoded 75 thousand hang-tags per hour, detecting and rejecting bad tags at speed. This year industry anchors Mühlbauer and Bielomatik have launched high-capacity, fully-industrialized “personalization” machines for printing and encoding tags at scale. A benefit of these systems is that they use chip-based serialization recipes that eliminate the need to pay 3rd parties to manage and disperse blocks of serial numbers. Now users expect inlay quality exceeding 99.95%. If anything is a required element of the whole product, it’s predictable quality at scale. 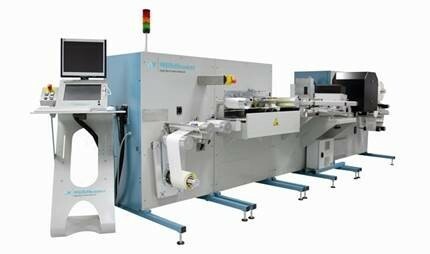 New Mühlbauer PL 60000 RFID Tag Personalization machine prints and encodes tags at scale. Other parts of the whole product have matured similarly. Software implemented as a cloud service has reduced the cost and time required for solution design and deployment. These solutions have expanded choice by enabling pay-as-you-go, service-based models. At last April’s RFID Journal Live, over 60% of solution providers exhibiting had cloud service variants of their platform. On the hardware side, application-specific readers are replacing general-purpose readers, making RFID less expensive and better suited to purpose. 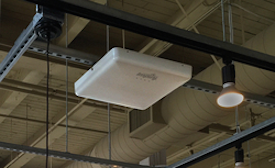 Ceiling-mounted reader systems with incorporated antennas and POE vastly simplify deployment for applications based on fixed infrastructure such as asset tracking. Using specialized readers and antennas, one vendor offers a turnkey, shelf-based RFID solution for jewelry stores for less than $7,500 per store, installed. New readers were launched this month with dedicated interfaces for programmable logic controllers to enable RFID applications in manufacturing. Bluetooth-connected readers give RFID users access to the vast potential of the Apple and Android app stores. RFID is no longer based on a few general purpose readers and antennas, but rather, hundreds of artfully-designed tools that solve specific problems. 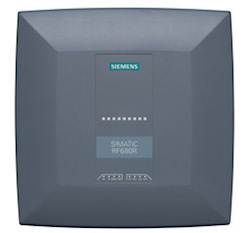 Siemens RF680R RFID Reader has dedicated interfaces for manufacturing automation systems. Impinj’s new xArray requires just a CAT5 POE network connection. As UHF inlay manufacturing quality has stabilized, a significant portion of inlay manufacturing capacity has shifted to Asia, much of it to contract manufacturers such as Arizon and Shang Yang. Lower regional costs and concentration of capacity have pushed tag prices down, enabling more end users to justify RFID projects. Inlay pricing has dropped below 5¢ in some cases. Arizon and Shang Yang are China-based contract manufacturers of inlays. In response, branded tag and inlay vendors have been experimenting with ways to expand their value bundle to protect margins, including moving up the value chain to deliver more of the whole product, including software and services. As tag vendors seek the right mix, Avery Dennison will be a bellwether. As an innovator from inlay design and manufacture to retail service bureau, the firm offers the most complete solution to the retail apparel industry, with the market share to prove it. The fact that Avery has not had similar success in non-retail segments, where it offers only commodity inlays, underscores the need to deliver a more complete package to be successful as a supplier to end users. Horizontal AIDC generalists are struggling. Relying on technology expertise, these firms implement solutions for serialization and tracking for any customer, regardless of vertical. As generalists, their website may list five to 10 market segments. Their solutions may involve a branded software platform, but the solutions require significant custom software and integration work. Every project is different, projects are expensive and sales cycles are long. Brand building is difficult because the whole world is their audience. Growth is proportional to headcount. It’s difficult to make a profit in this game. These companies must go vertical or get acquired. In contrast, vertical solution providers differentiate on domain expertise. They sell a solution that solves a problem for specific users. For them, RFID is just an enabling feature. This model has advantages. The solution is more standardized and requires less customization – the firm can grow by selling more of the same thing. Margins are high, sales cycles are relatively short and it’s easier to build a brand just by doing the same thing day after day. Some have delivered their solution as a service, giving users a pay-as-you-go option. We follow companies in healthcare, asset management, race timing and retail that are making money this way. Even if you follow the RFID industry you may not have heard of them, but their customers know them well. FileTrail got its start selling document management and tracking solutions to law firms. Terso offers remote inventory management for healthcare and biosciences on a pay-as-you-go basis. The focus of the RFID industry has shifted from technology to profits for both vendors and users. Channels are aligning for efficiency and scale. Generalists are becoming specialists to better solve real world problems. These trends are the sign of a maturing industry.